Nuit Blanche Tomorrow! ~ The Toronto Hare Krishna Temple! Festival Nuit Blanche - an all-night arts festival which transforms a huge area of downtown Toronto into a giant contemporary art museum. 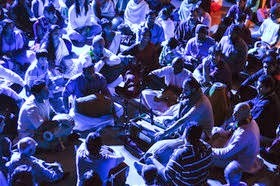 Last year, we presented a 12-Hour Kirtan that spiritually blew the roof off! This year, we hope to have the same effect on downtown Toronto with a large harinam going out to the streets! The plan is to meet up at the Temple on Saturday, October 5th at 11:00pm and walk to Yonge and Wellesley, where we will set up carperts in the middle of the road and bring the sacred sounds of our tradition to the masses! Please dress in your best Vaishnava traditional attire and warmly as it might be cold out. Bring your smile and enthusiasm to chant! We hoe to see you there!